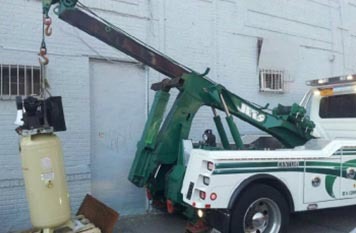 At Jets Towing we have specially dedicated tow trucks to handle light duty towing and recovery of all types. Our tow truck operators are equipped with all of the necessary equipment to upright overturned cars, station wagons or mini vans. Whether your car has been in an accident and is now inoperable, or if you have simply gotten stuck in an off-road situation due to tough terrain – our light duty towing roadside assistance can easily ensure that your vehicle is expertly extracted and safely towed back for repair. Our expert towing operators deftly handle the equipment to ensure that no damage is caused to the vehicle while it’s being extricated and towed away. Our team of operators and fleet of tow trucks are available at all hours for all types of light duty towing and recovery jobs. Just give us a call at any time of day, any day of the week and we will rush to you as quickly as possible and assist you for all of your towing needs. Whether your vehicle breaks due to mechanical failure or an accident, our light duty towing in New York safely transports your vehicle. Our towing services are available 24/7. We will treat your vehicle with the utmost care and provide special considerations if required for its safety. We can tow any light duty vehicle, including exotic cars. Our drivers can also assist you with range of roadside assistance services such as delivering fuel, jumping your battery, assisting with tire changes, recovering locked keys, etc.